However, because of scaffolding and so forth, we could not see the temple-like exterior at all and, on the inside, there were poles all over the place plus glass between visitors and all elements of the shrine. Based on signage, I conclude the glass is a permanent protection and not just related to the maintenance project. And we could not take photos. This Buddha is not covered in gold leaf or anything else to add color, and I liked it that way. I generally prefer statuary that comes with toned-down or no color. 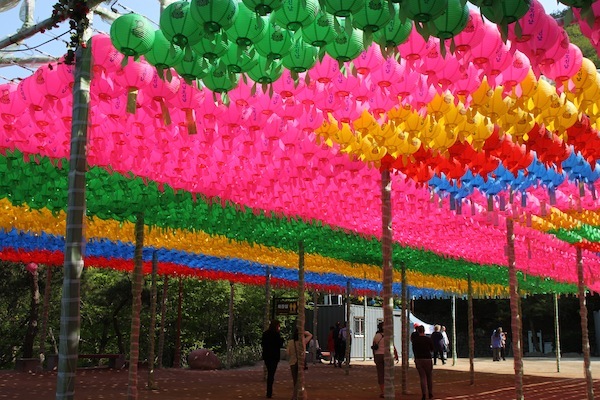 At the base of the steps leading to Seokguram, there was a veritable blanket of colorful lanterns covering an open space that looked as if it might otherwise be a parking lot. Lanterns were everywhere because my visit occurred in the last few days before Korea’s annual Lotus Lantern Festival, the celebration of Buddha’s birth. Hundreds of lanterns seen at the site of Seokguram Grotto at Gyeongju, South Korea. Our next stop in Gyeongju was the Bulguksa Temple, which houses a couple of the country’s most prized pagodas. The main temple building at Bulguksa in Gyeongju, South Korea. Responding to a question, our guide said stupas and pagodas are the same thing, but words from different parts of Asia. 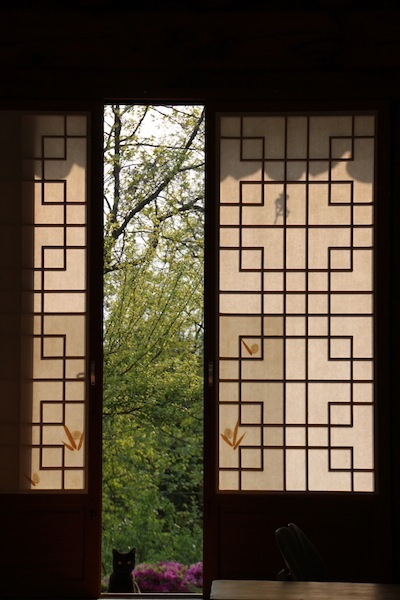 Paper doors opening onto a room at Bulguksa Temple in Gyeongju, South Korea. At the bottom of the opening, note the profile of a black cat peering through the doors. This also is a UNESCO site. Bulguksa was built in the sixth century but burned during the Imjin Waeran War (the war that accompanied the Japanese Invasions of 1592 to 1598), then rebuilt early in the 17th century. We admired temple buildings under very nice light, watched a couple of temple cats and noted huge jars for making kimchi and soy sauce. 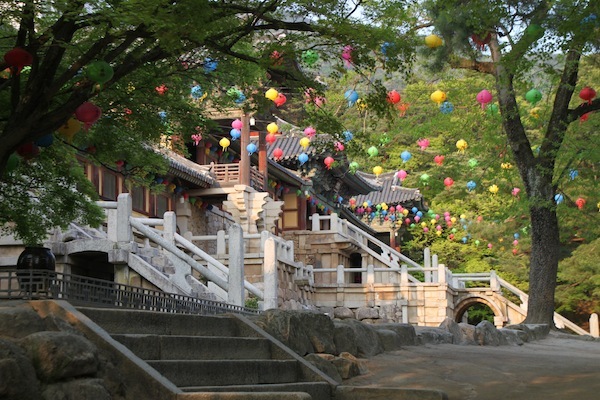 Bulguksa is one of 16 Korean Buddhist temples where tourists can stay overnight for one or a few nights and experience aspects of a monk’s life. 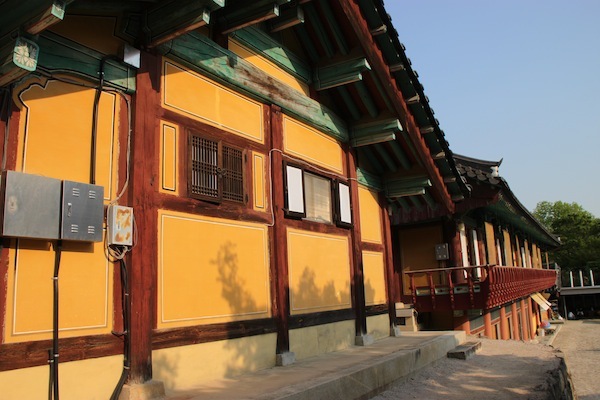 A sample of architecture at Bulguksa Temple in Gyeongju, South Korea. We were served tea and small fruits, then offered the option of creating a rubbing — a pagoda rendered in black ink on white paper with a slight 3D quality. I participated in other cultural projects on this trip, but not this one. I was not interested in playing in ink. 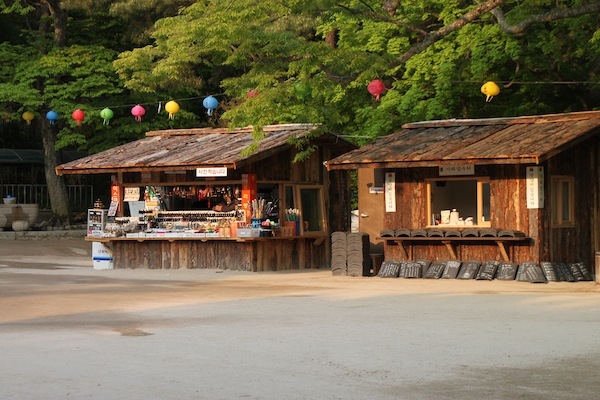 Souvenir stands at Bulguksa Temple in Gyeongju, South Korea. Just as an FYI, Gyeongju is home to the Cheomseongdae Observatory, the oldest existing observatory in Asia, dating from the seventh century. It is still another UNESCO site, but we were running out of time (and energy, I might confess) so did not squeeze this one in. We returned to Seoul aboard one of Korea’s bullet trains, a very fast two-hour, 17-minute journey. The railroad station at Gyeongju was a surprisingly large affair, as well as modern and good looking. The train was not quite as spiffy as the high-speed trains I have ridden in Europe. But, would I use it again? Absolutely. It was a very comfortable and fast way to return to the capital.